There was a time I didn't drink coffee. I can still sort of remember it. The sun still came up in the morning. The birds still sang. Little children played in the park. Then I met Andrea Jerome. She was a coffee fanatic. She had to be coaxed from the bed with quadruple espressos and inspired to keep working with semi-hourly installments. I thought I could cure her. Guess what. Now I am just as bad. Yes, the sun still comes up, the birds still sing and children still play in the park. But not until I have had my first cup of coffee. It used to be that going to Greece was a step back to the stone age as far as coffee went. We could drink a Greek coffee, you know the stuff they used to call Turkish coffee until 1974 when the Turks invaded Cyprus and even the harbor of Turkolimino became Microlimino. 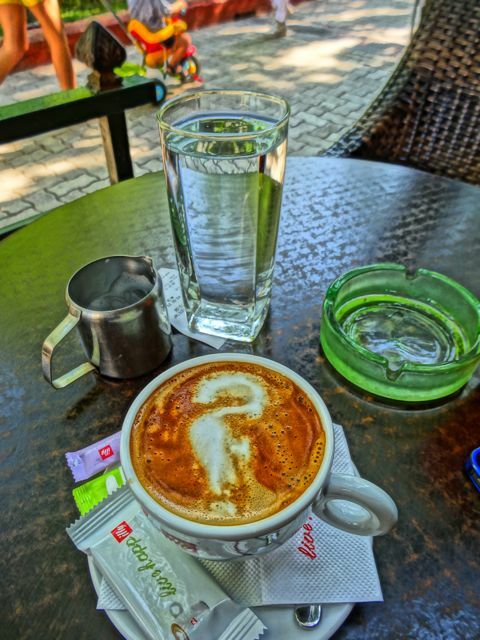 But Greek coffee has to be made right and there was a period when many places that served it, with the exception of the most die-hard old men cafeneon, did not put that much care into it. Plus, drinking it takes time. You literally have to wait for the dust to settle and you can only drink it to a certain point. Any further and you are chewing coffee. Yeah it can get you off and that is, after all, our intention. But the cups are so small and my lips and appetite so big that there is a psychological factor that makes it less satisfying for me in the morning. Afternoon is a different story and after early ouzo with the rest of a long day ahead, a well-made Greek coffee can't be beat. Frappe's are the lifeblood of Greek society. Made with instant Nescafe mixed with milk, water lots of sugar and ice, a frappe will provide you with a chemical buzz like caffeine only more intense and under it's effects you are likely to have very profound thoughts as the dust is shaken off synapses long retired from duty. The Greeks drink these all day and never leave the cafes. 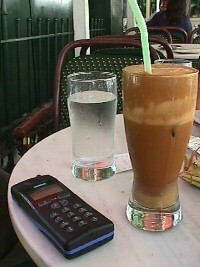 Maybe the reason so much wine and whisky is consumed in Greece is directly related to the frappe consumption. But there is something decadent about starting the day with a frappe rather than a cup of coffee. So you have hot Nescafe. Same nervous buzz, but for me that means doing the Greek equivalent of the 3 martini lunch, the one carafaki ouzo mesimeri. Yes things were tough for us in the old days. We used to bring our coffee with us, ground in sealed bags which took up valuable luggage space along with our mini espresso maker and gas burner. But you never knew if you were going to be able to find a decent cup of coffee and we had to be prepared. Who wants to be in the most beautiful country in the world feeling lousy? There were places you could find an espresso like the Grande Bretagne Hotel and a couple of the very fancy cafes and restaurants. But just because they were expensive did not mean they were going to be any good. And who wants to drink coffee in a place where you feel uncomfortable if you did not bring your own butler and chauffeur? Then just as in the USA, espresso began being served everywhere. Some of the old cafe's bought new espresso machines and more and more coffee bars began opening. Now you can find cappuccino, espresso and something called fredo which is iced cappuccino, a sort of snob-frappe, almost everywhere. But do people know how to make a decent cappuccino in Greece? That is the question because who cares if you can get it on every corner if it does not get you off? In many places you can get great espresso. Maybe better than in the USA. Whether it is better than in Italy I don't know. But cappuccino, we have discovered, are more a matter of chance. But leave it to Andrea to come up with a plan that insures that there will be enough caffeine in your coffee drink to get you to the next cup, whether that is in 5 minutes or in five hours. When we wake up in the morning we go to one of our favorite cafes and each order a double espresso. Then, (this is the important part), we order zes toe ga la ksekorees ta . That means 'hot milk on the side'. Then you can pour it in to your double espresso for the desired taste to go with the required potency. A couple of these and you can climb the Acropolis several times if you have to. if you start dragging in the afternnoon just one of these will get you to dinner where the wine can take over. So we may as well face that some of us are seriously hooked on coffee and the thought of going somewhere that good, strong coffee is not available fills us with a kind of angst. Maybe once we were strong, independent and caffeine free, but now we must face the fact that a good strong cup of coffee is required to motivate us to experience the wonders that Greece has to offer. We can always take the steps to quitting our addiction when we return home where we have familiar surroundings and plenty of psychiatrists to get us through those first difficult weeks, months or years. But to quit drinking coffee in Greece is like trying to quit smoking in Greece, or giving up food and sunlight. In Greece we drink coffee. And there is plenty of coffee for everyone. When I am staying at the Hotel Attalos it is usually right when I have arrived in Greece so I wake up long after the breakfast room has closed. But if I walk out the door I have a lot of options. If I turn left there is a small cafe on the street called Bet Cafe. It is called that because it is owned by the guy who owns the betting shop next door where all the gamblers spend their day looking at screens and counting money. I would not even mention this place except they make good coffee and the kids who work there are nice, and if you are tired from a flight and hungover from your first night in Athens you want to get caffeine-ated fast. 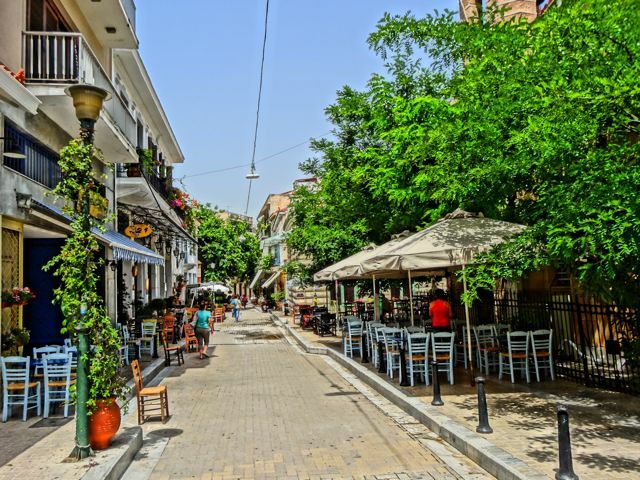 But if I have a little more energy I cross Athinas and walk up to Aeolou Street where there are a number of small cafes, usually in tree shaded areas, all with good coffee and free wireless internet if you just ask for the password. My current favorite is the family owned Pera Cafe at #57 Aeolou on the corner of Bissis Street which has good coffee. The owners come from Istanbul and they also serve yogurt with fruit, honey, nuts and just about anything you would find in your normal Greek cafe and an entire menu of Middle Eastern dishes. 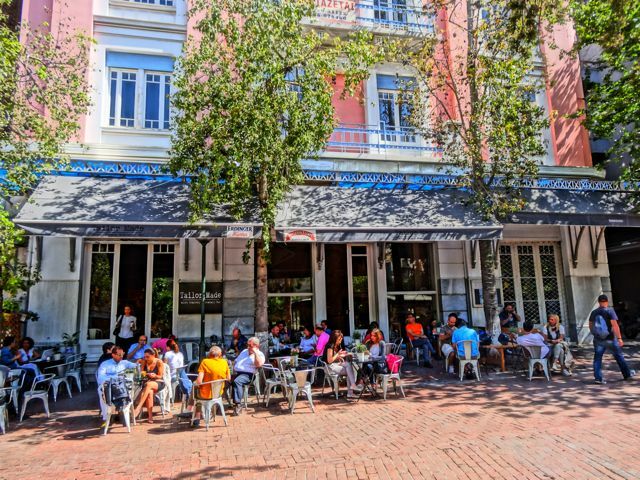 At #48 is a cafe-restaurant called Mamma Roux, owned by an American jazz drummer, and they have brunch on Sunday at 1pm and live jazz at 5:30. The food is a mix of American bistro, Mexican, Indian, Asian and Middle Eastern and they have excellent coffee. If it is full of people and you can't find a table then don't worry. 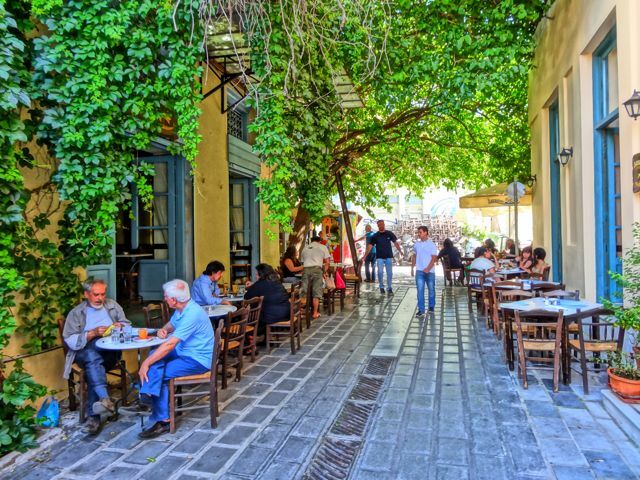 You have come this far and just go another half block to the church of Agia Irini and take a left into the square and there are a number of cafes with great coffee, tables on the square, and friendly waiters. You could sit here all day. Try Tailor-Made, right on the square next to the famous Kostas' Souvlaki shop. Andrea's favorite cafes is Eliasporo (also known as Katerina's, the name of the owner) in Psiri on the corner of Maoulis and Palados at Iroon Square. Convenient because it is also an ouzerie with great mezedes so you can spend the whole day there. 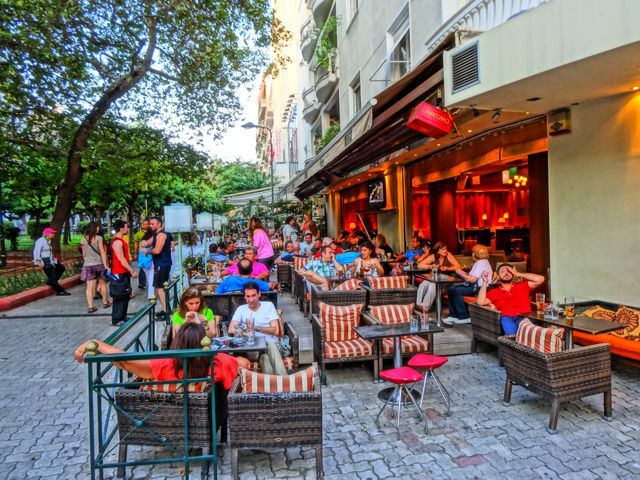 Also try the traditional zacharo plasteion (sweet shop) right across the street from the Taverna Psiri on Ag Nikolaos Street which is one of the streets that connects to the square. If you cross the square and walk down Agion Anargiron Street there are a number of cafe/bars mixed in with restaurants, especially as you get towards the end of the street. 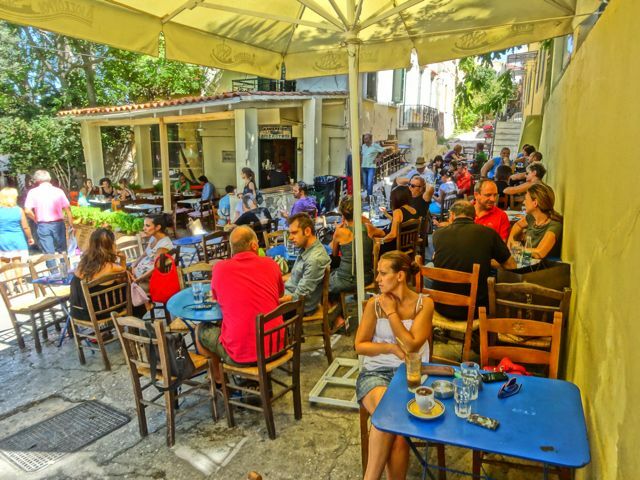 Try Cafe To 21 which has tables and chairs on the street and on Agia Anargiron Square. If you stay long enough you can move next door to Nikitas for lunch or any of the great restaurants in the Psiri neighborhood. Or you can stay right where you are and have lunch and dinner there. Another great place is the Terina where Adrianou street meets Kapni Karea at the small Platia by Hadrian's wall. Lots of different kinds of coffee and a huge international menu and the interior is beautifully decorated. You can sit in the square outside when it is sunny and warm. The owner also has the traditional fish tavern Psaras. Like Psaras Terina is high quality and very professional. Also the cafe called Kapni Karea Hristopoulou street (alley actually) between Ermou and Metropolis street right by the small Church of Kapni Karea. If you stay there long enough in the afternoon people arrive for ouzo, mezedes and live rembetika music. My wife likes the Cafe Central which is a big Parisian style cafe on Metropolis street right next to the main cathedral, the one that has been under scaffolding for the last twenty years. 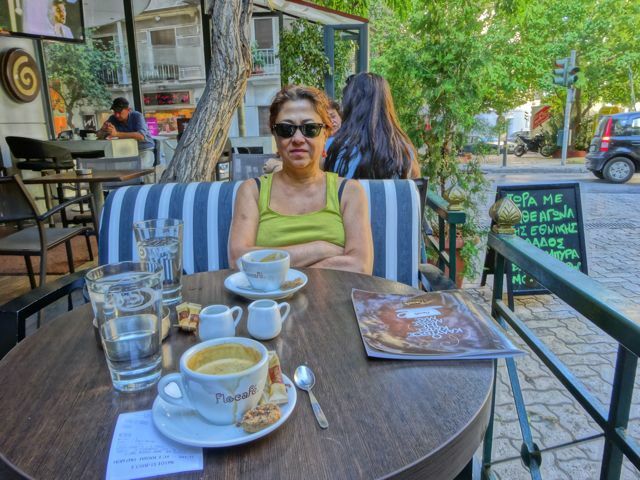 There are a bunch of nice cafes around the square on Kydathineon Street in the Plaka. We used to go to Ippos but one is as good as another and you are away from the traffic of Athens and the waiters are quick to shoo away gypsies and people begging or trying to sell you something. The Cafe Dioscouri is at 39 Andrianou right in the flea market. If you are going to the Sunday market come here early because it fills up. They make excellent coffee and it is a good spot to watch the people go by. If you are coming from the Plaka you will have to go around Hadrian's Library to get there since Andrianou Street comes to an end and begins on the other side. This is a great place to watch people on Sunday. It gets crowded so you have to come early. 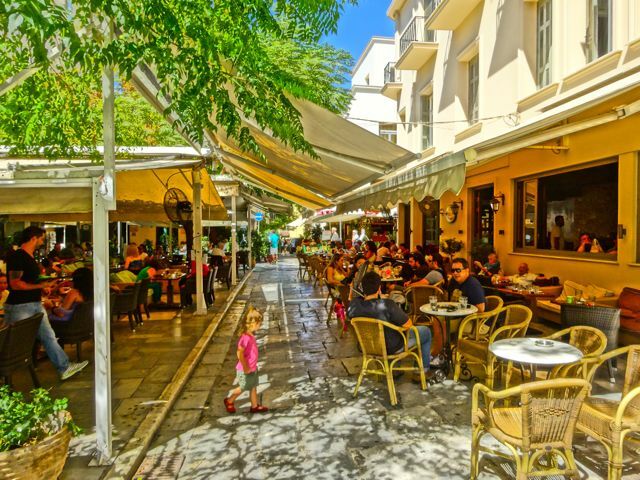 Even if it is there are half a dozen or more cafes on the street overlooking the Stoa of Attalos and the Ancient Agora. In terms of view, people-watching and finding good coffee this is the best street in Athens. My favorite hangout in the winter was Diodos which is a cafe-ouzerie right across the street from the entrance to the Ancient Agora on lower Adrianou street. Very friendly service and good espresso and other coffees. Another one of those places that you can come for a coffee pick-me-up in the afternoon and make the gentle transition to ouzo and meze and hang out for the next 6 or 7 hours. They have dinner too. Look for the most traditional chairs and tables and that's the place. You will have to wander around the Plaka a bit if you want to find the Cafe-Milkshop Klepsydra and I can't even say for sure if they make good espresso. But the cafe was owned by Andrea's friend Tstisinos who died and it is a favorite of locals. If you find it let me know about the coffee. I think it is on Trassivolou street at the corner of either Klepsidras or Alimberti right under the Acropolis. I met the new owner one day when I was wandering around shooting photos for my Athens Graffiti page and he was a really nice guy and offered to treat me a coffee without even knowing I had a famous website, so go check it out since every good deed should not go un-rewarded. But if you can't find it you can just go to Dioscouri which is a famous cafe on Dioskouron Street which borders the ancient Agora and is more or less an extension of Aeolou Street. At Fokinos Negri in Kypseli there are dozens of cafes, one after the other and in the afternoon they are crowded with people and this is the place where I do most of my coffee drinking. Some of the cafes are for old people and some for young. The most popular cafes can have a couple hundred tables and are always packed at any time of the day. Though most people sit outdoors some of the interiors of these cafes are spectacular and it seems like they try to out-do each other to have the cleanest and most interesting restrooms. It also seems that they change the furniture and decor every year which gives you an idea of how much money is to be made in the cafe business. The street itself is a big pedestrian mall, like a park that goes on for several blocks. There are some good restaurants here too so you can come for your afternoon coffee and hang out until dinner time. Try the Foibos Cafe at #19 which is a small un-pretentious place across the park from most of the larger cafes. They play classical music and jazz and are owned by a very nice Greek-Australian woman named Julia and her two sons. I usually go to a place called The Happening, which in the morning is full of old people. It does not seem very happening but they make great coffee and have wireless internet and on a hot summer day there is a breeze that comes down the mountain and hits that spot. If you take the #2, 4 or 9 trolley from the top of Syntagma in front of the park, going towards Omonia you get off at Platia Kypseli and walk down. You can walk there from the Archaeological Museum up Patission street and make a right on Agia Melitiou and left on Drossopoulou. I love Fokinos Negri. Its the kind of area that people go to Paris for and it is right here in central Athens. When you climb to the top of a mountain and there is a coffee shop there that overlooks all of Athens, does it really matter how good the coffee is? I would have loved to have sampled an espresso but after climbing Mount Lykavettos I did not want to risk having a heart attack so I will let you be the judge as to whether the cafe belongs on the same page as these others. From the cafe you can see the Acropolis and all of Athens and even the ships leaving Pireaus for the islands. You don't have to climb the mountain if you don't want to. The Funicular is a train that goes up and down the mountain and you can catch it at the top of Ploutarchou Street. Walk down. It is easy and good exercise. On the other side of the coin the fast food place on the corner of Ermou and Athinas, though lacking in atmosphere, actually make their Greek coffee the old style...in hot sand! 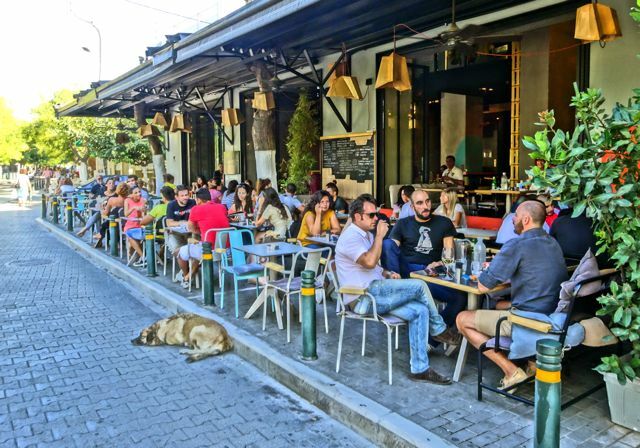 There are cafes all over Athens. 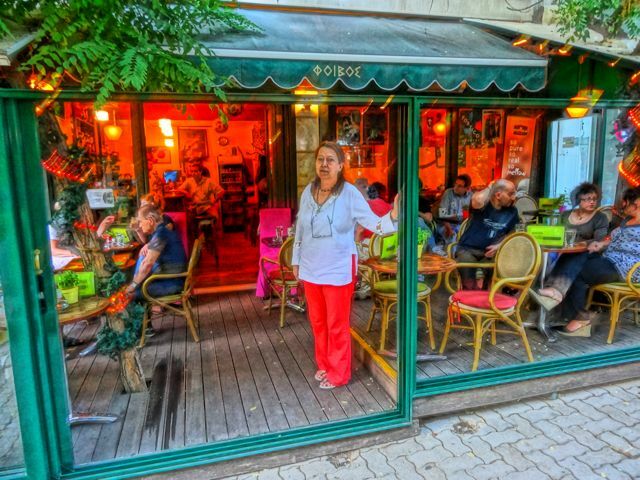 Anywhere there is a square or a space on the street to fit a few tables you will find a cafe, cafe-bar or cafeneon. 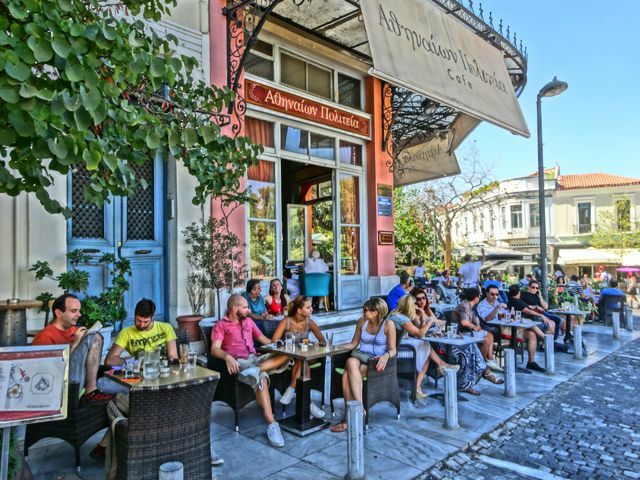 Some other places to hang out and enjoy a coffee or a drink and watch life are Thission, the cafe in the national Gardens, Zappion, the path to the Acropolis, Makrianni, Gazi and many of the major public squares. Half the major avenues downtown are being converted into pedestrian streets and that means even more cafes. In a country like Greece where the climate is prefectly suited for hanging out and drinking coffee there can never be enough cafes. I almost forgot to mention. There are now a couple Starbucks in Athens and I am sure there will be more. It's like bringing coals to Newcastle but if you are one of those people who refuse to visit a country that does not have a Starbucks then you are in luck. To be honest with you I LOVE Starbucks Frappuccino. It's like a milkshake with a buzz and is tough to beat on a hot day in Athens. 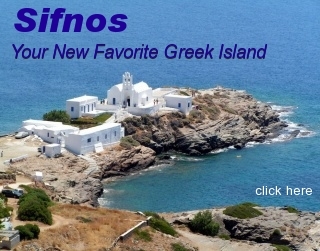 For inexpensive but decent espresso, capuccino, latte, fredo etc check out the Grigoris chain which are all over the city and even on some of the ferry boats. They also have spanakopita, tiropita, and lots of other pitas and sandwiches as well as traditional Greek coffee. The Flo-cafe chain also has cheap coffee drinks and they are everywhere. If you are looking for really great coffee I recommend Coffee Island. They are all over the city and not only sell all your favorite coffee drinks but they also have excellent bulk coffee that you can get ground in any style and take with you to the islands if your taste is above the supermarket variety. You can also buy a small stove-top espresso-maker, press-pot or just a simple cone filter and make gourmet coffee in your room. And for you people who get your coffee in the supermarket the freeze-dried or vacuum packed Lavazza which you can find in just about any supermarket or grocery store is pretty good too. 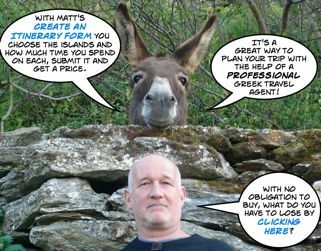 The fact is that when I first wrote this page there was a need for it because espresso was just being introduced to Greece and cafeneions were just beginning to be transformed into cafes. Now you can find good coffee anywhere and cafes are bringing the prices down because their customers can no longer afford to pay Parisian prices for coffee in Athens. So my advice is to look around the neighborhood your hotel is in and find a place that has comfortable chairs, shade, a nice view, and low prices and if you order a coffee and it is good, make that your home.